Synopsis (via Goodreads): A sweet and hilarious chapter book about a boy and a bat, two unlikely friends who bond over loneliness, jellyrolls and Darth Vader. DNF after the first quarter or so. I wasn't able to finish reading this book to my son, and I wasn't motivated to read it on my own without him. We stumbled through the first part of the story, and I think that's because the bat's words and phrases came across the wrong way. I'm not sure if he spoke another language, or if he somehow misheard how things were pronounced, or if he just had issues with saying certain things. The why wasn't clarified within the story (at least not what we read). Instead of being cute and endearing, it was obnoxious and detracted from the book. "Daniel was no bat expert, but something about the shape of the face made him guess it was a boy bat." That statement and how it was presented really rubbed me the wrong way. In the end, there were more than a few things about Megabat that bothered me, and my son also didn't seem particularly invested in what was going on. He did stop me once to ask what a "smooshfruit" was. This was my only DNF for April and now you know why! Was there a book you just couldn't finish this month? Let me know in the comments, or feel free to link to your own post! If it's not keeping the little ones interest then I wouldn't be continuing either. It's funny you mention that, there's been a few illustrated children's books over the years that have been so incredibly sexist, so seeing that throwaway line doesn't surprise me sadly. Sorry you and little mister didn't enjoy this one Linds. Does he typically enjoy adventure type books? Might be worth picking up Percy Jackson if you haven't read that one already. If I'm reviewing a children's book, I love to read them with my son! It's always fun to get his opinion and see how he reacts to the story. I've noticed a lot of children's books are suggestive and don't represent the values we try to teach. We want our kids to be accepting and understanding, but some books teach a single-minded viewpoint. It's great when you don't have to DNF anything! It means you've had a wonderful month of reading. It is always hard to DNF a book but sometimes it just has to be done. Sorry these didn't work out for you. I'm finding it easier to do these days. There are so many books I want to read, and I don't want to waste my time on something I'm not enjoying. It doesn't mean the book was bad, just that it wasn't for me. The story rubbed me the wrong way! It didn't help that the bat made up his own words. My son kept stopping me to ask what something meant, and then I had to explain that it was a nonsense word made for this book. 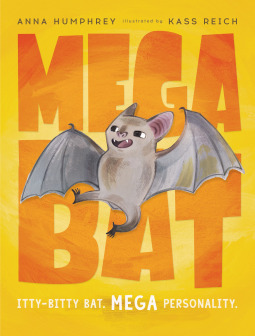 I could sort of understand what the bat was trying to say, but I was annoyed after a few pages. That sounds pretty awful! Sorry it didn’t work for you or your son. I used to not DNF... I would struggle through reading books that I was not loving just to finish them, then I learned. Don’t feel guilty put it aside and don’t look back is my motto. THis sounds like a book that won’t work for my kids either. I will pass. I was the same way! I always finished a book even if I haaaated it. It really dampened my desire to read anything, so I decided to stop. If I don't like it, I stop reading and move on to something else. There are too many other books to try, and I don't want to waste time on something I don't love! I'll even ask to be removed from a blog tour if I don't finish their book. I'll review it on my on time later, but a blog tour isn't the place for it. I'm glad this was the only DNF of the month, but sorry neither you or your son really enjoyed this one. I think the "it's a boy" based on the face would annoy me too. Right? How hard would it have been for the kid to just ask the bat its name? Awww, that's a shame this one didn't work out better for you and your son. The premise sounded so cute. I thought it sounded like a really fun book, but it wasn't what I expected. The language and the content made it a hard story to read. That was me a few years ago! Now I can't keep reading something that I'm not enjoying. I'd rather spend my time reading something I love! If you read because you feel like you have to, it starts to feel like a job or chore. I didn't want that for myself. I don't know why but this is making me giggle a bit that you DNF'd a children's book lol How long was it? I can see why though -when you have to struggle just to try to understand what he means. If I'm struggling through a children's book, what does that mean other kids will do? Are they going to have the same issues, or think the weird words are humorous? It's hard to tell, and that's why I like reading them with W. I get his perspective as well as my own. He seemed confused and uninterested, and I was annoyed and happy to stop reading it. Oh man, we have this one to review too. Oh well, we'll try it and see how it goes. Hmmm yeah, I can see why that statement rubbed you the wrong way, especially in a kid's book. And if your son wasn't even into it, then no point in continuing! I agree! It's a children's book... so I want my child to enjoy it, lol!